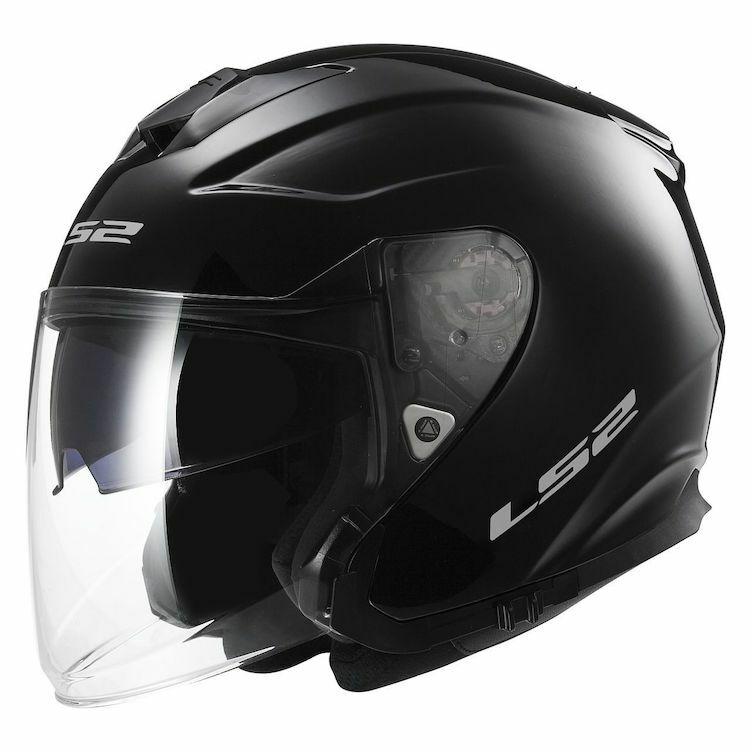 LS2 Infinity with sun shield is a high value, high performance, value priced helmet. The LS2 Infinity uses 3 shell sizes for the ultimate fit. The shell is made of LS2’s proprietary High Performance Fiberglass Composite (HPFC). This ultra-light, ultra-strong material is state-of the-art for energy dispersion and safety. A multi-density EPS safety liner offers the latest technology in energy absorption. Add the convenience of the Twin Shield System drop down sun shield and reinforced chin strap with Quick Release System buckle and you have a world class helmet at an unbelievable value. The comfort liner is covered in a high-tech, breathable, hypoallergenic fabric. It is fully removable and washable so you can keep it as fresh as new. Cheek pads are contour cut using LS2’s 3D Laser Technology. The face shield is optically correct, and is fog, scratch and UV resistant. Fully adjustable flow-through ventilation with channeled EPS keeps you comfortable, regardless of the weather. Great for touring, commuting, summer, or scooter, the Infinity is a helmet you can live with, day in and day out. Note: The LS2 Infinity Helmet fits snug in the cheeks and runs slightly small. If between sizes, choose the larger size. My wife needed a light helmet due to a neck problem she has. When we couldn't find a good full face or modular we tried the LS2 Infinity. Lighter, nice lines and for a 3/4 helmet very quiet. Only draw back was mounting a Sena 10. The ridge wouldn't allow the clamp to sit flat. A little epoxy putty filled the gap and the clamp was on. Keep in mind I had the Sena before I bought the helmet. If I didn't have that I would have bought the comm set built for the helmet. Liked the overall quality and the internal visor. Too tight around cheeks and ears. Very noisy and no airflow whatsoever. Do not buy this helmet. It is not made with quality in mind. Less than a month of owning this helmet and on my 3rd use of helmet, 3rd 100 mile ride, the left shield anchor came unscrewed, loosening one side of the face shield, then a mile down the road the wind ripped the entire face shield off the helmet, turning my head with it in the dead of night. Very shocked. I tried for two days to contact lS2 for warranty and get some parts mailed to me, but still no contact. Run don't walk away from this helmet and any other LS2 products. I got my LS2 Infinity OF521 about a month and a half ago. (I forgot). What first caught my eye was the styling of the shell. I think it's a beautiful three quarter helmet. I tried it on and it felt good although it was a little tight around my ears. It has everything buyers of these kinds of helmets are looking for. It has decently placed vents, a drop down sun visor, a comfortable liner and a face shield that is big enough to protect you from dust and bugs on the road. It's lighter than my other three quarter so that's good. I also like the silver reflector on the neck roll. I only have two gripes with this lid and I wouldn't consider any of them to be major things. First, it doesn't seem to be as well-constructed as my other three quarter. The materials seem flimsy in certain parts of the helmet. Second, I hardly use the sun visor. It looks like it goes down far enough but it doesn't . It can potentially give anyone a headache if used for extended periods of time and when retracted, you can see the bottom of the visor just above your brow. You eventually get used to it though. Overall, this is a very good helmet that I wouldn't hesitate to recommend to anyone looking for a good value three quarter helmet with all the bells and whistles. .
Great features in quality affordable helmet. Really loud. Very tight at jaw line. i shopped my helmet and found revzilla had the best price . they also had excellent return policy. my helmet was a size small and i needed a medium, revzilla with no problem switch them out for me . Easy peasy thanks revzilla!!! My previous helmet had hot spots on my forehead, which after reading many online reviews, indicated that the sizing wasn't proper. I needed a long oval helmet and found this LS2 to fit the bill. The fit was true to measurement guides and fits very well. The field of vision is great, even with the sun shield down. It does get a blue tint towards the top of the shield for some reason, but it doesn't affect vision at all. The shield has a tiny lock in the closed position. To open, you have to push up towards the left. Being a righty, this makes it a little awkward for me to open the shield quickly as I need to reach to the left side in order to quickly raise the shield. That would be my minor complaint about the helmet. Ventilation is ok, but I think there should have been more venting available like the HJC Jet helmet, which was my other choice. The sun visor is easy to use, even with gloves, although it's a push back to bring down the shield. Logically, I'd rather push forward to drop the shield, and push back the lever to retract it. Seems odd it's the opposite, but it doesn't take long to get used to it. As with most open face helmets, this is loud. Much louder than my modular helmet. Doesn't require earplugs, but if you're used to a quieter ride, it won't happen with this helmet. Overall, happy with it as it's much more comfortable for me. I had to replace my 8yo Scorpion 3/4 helmet. I have a small narrow oval head and tried multiple helmets both in stores and ordering from Revzilla. Nothing fit right. I really wanted an Arai or a Shoei, but neither brand fit properly. A helmet has to fit right the first time when considering spending that kind of money - and I didn't want to spend even more to possibly have it fit better by having to buy different cheek pads. Revzilla's new helmet list included the LS line. What intrigued me was the narrow oval shape diagram at the top of the description.. (That's a GREAT feature Revzilla!!) It has the inner sun visor I was looking for so I ordered it - even without any reviews or online videos. I ordered the small and it fit great right out of the box - snug like it should, but not too tight. The helmet is very nice, although a little higher at the back of my head than I'm used to. The inner sun visor is a little tricky as it has a horizontal slide instead of vertical which I think would be easier for any rider. The helmet is nice and light weight. Both sides of the face shield fit into a little groove on the front of the helmet which in reviews of other helmets is a great safety feature. The face shield is clear and has great visibility. The only bad thing I see about the the LS2 is that the face shield doesn't have any detents or stops to keep it at different levels when riding. I can't say how the venting will be in the heat - that will have to wait for the summer. I have 2 motorcycles - 82 KZ1100A and 08 Honda Shadow Spirit 750 - different rides for different itches!! Appeared to be good quality and found a size to fit my big head! price/sizing /oval head shape .want a 3/4 helmet- I ride on a scooter but its a Vespa 300GTV ABS. so i will have small trips on highway possible. I wish I never saw this helmet! Had the 3XL big size. Had chosen another one, but it's largest 2XL size wasn't big enough. is this helmet fitted for earphones? Would love to see a break down video on the ls2 Infinity, any ideas of one in the future? How does this compare with the Shoie J Cruise? BEST ANSWER: Personally, I was disappointed in the J Cruise. I hate seeing the helmet at the top of my field of view, and I get booming, percussive sounds that earplugs do little to help. What is the difference between the LS2 Infinity 521 and the LS2 Infinity beyond? What are the helmets sizes for each shell size? Can you ride with the shield up? BEST ANSWER: Yes. I have a large windshield so I can ride up to about 55 mph no problem. Once I'm be on 55 mph I definitely will have a shield down. For riding in town yes but on the highway I'd say no. With the shield up on the highway it catches too much wind. Nopes , you will get a lot of drag .. on very slow speed its okay . I just purchased the size small and it is incredibly tight around the ears and jaw. Has anyone found this and will the medium size give me a better fit or does it make a difference? BEST ANSWER: I have the same problem with XL size. After a while, i am begining to get used to the fit: Very tight! Thanks for your response. It makes me wonder why no one else has mentioned this. It is incredibly tight for me and I wear a small in all other helmets. In fact my ears were red after wearing it a few minutes. Hoping the medium makes a difference! I bought the medium and found that after a couple of rides the fit is perfectly fine. Go one size up! Very tight around the cheeks and jaw. Will an SMH-10 intercom clamp work on this helmet with the visor slide? BEST ANSWER: Yes it fits but the microphone is now to the left a bit. Find I have to yell to answer it. Will this helmet accommodate eye glasses? BEST ANSWER: I have not tried them with the sun visor down but with the main visor it works. I've used them with eyeglasses and sunglasses with no problem.